Day 4 of sushi theme bento. I chose futomaki sushi and I want to make a confession that I didn't use my sushi mat to make the futomaki :p but I used my futomaki sushi mold. You can find this mold at Daiso or many online stores and ebay. Futomaki sushi is a thick sushi roll that my kids usually called chubby sushi instead of futomaki. It has bigger size than the usual sushi size (usually around 3-4cm). I put tobiko, crab stick, avocado, lettuce, tamago and cucumber for the fillings. You can put other fillings too for the futomaki. Inside the box : pea pods, edamame, small orange, crab stick ball skewers, carrots + cucumbers, noodle shapes konyaku jelly and decorated quail egg. Outside the box : rice crackers. The crab stick balls are usually used for salad but I think they are also good in bento. They taste like the usual crab stick only different in shapes. Tomorrow is the last day to make the sushi theme bento, any idea what type of sushi should I make? And is there anyone who can notice 1 mistake that I made on this bento? @Kids Dream Work : Hahaha ... you are so sweet! Yes, I just realized when I made the post tonight. But too bad, the bento gone already so can't take new picture to replace it :p Thanks for your comment! 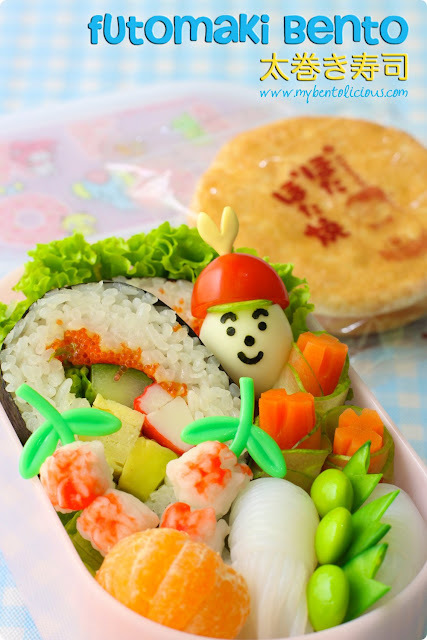 I've always admire moms who make bento for their kids as it's such a time consuming effort! BTW, I found you through Anncoo's. I don't see any mistake in this perfect bento. You and Rachel always make my hand itchy, must try to make some bentos after CNY. I don't see any mistakes! The flowers are upside down, but I don't think that takes away from your bento perfection! This looks really yummy! Flowers up side down? I thought that would be some fruits! Aww upside down flowers don't make it a mistake! It just adds character to the bento :D Which is already beautiful! Flowers upside down? I put them like that myself on purpose, for variation. Maybe people have been saying my bento are wrong, hehe! Yoohoo! Sushi parade on Bentolicious :D. I learned a lot about sushi from you Mbak Lia. So, thanks a lot for sharing it. How about California Roll Sushi for the next? nice rolls - u do them well, mine are always too big or squishy! @tatabonita : Thanks a lot Tata! Hopefully next time I can make California Sushi Roll ... Is this your favorite?